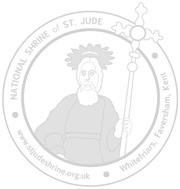 The National Shrine of Saint Jude, Apostle and Martyr, is served by the Carmelite friars at Faversham, in the southern English county of Kent. The shrine adjoins the parish church of Our Lady of Mount Carmel, also served by the friars. Both the church and the shrine have an interesting story to tell, and you can read something of their story on this website. Please take a look at our up-to-date news; our recent newsletter; and our latest Saint Jude Focus. The statue and relic of Saint Jude in the National Shrine. The Carmelite friars took on the care of Faversham parish in 1926. They acquired a building on Tanners Street (originally a school for Quaker children and later The Empire Cinema), developing it as a Roman Catholic church in 1937. A number of well-known and established artists were employed to decorate the church and later the shrine of St. Jude which was built in 1955. The parish church (left) and shrine of St. Jude (right) in Faversham. St. Jude is referred to in the Bible as one of Jesus' relatives and Apostles, and a letter often attributed to him is preserved as part of the New Testament. He is widely known amongst Catholics and other Christians as the "patron saint of desperate cases", and thousands of devotees worldwide attest to his powerful intercession with God. You can read more about Saint Jude in the next section of these web-pages. Pilgrims at Faversham lighting candles as a sign of their prayer. Since the 1950s thousands of pilgrims have come to Faversham from all over the world to visit and pray at our little shrine to Saint Jude. It is not a large building, but it has become sacred with the prayers of the many pilgrims who have come here, and who tell movingly of their encounters with God and with one another. A Carmelite friar blessing a pilgrim. Please be assured of our prayers. You may like to leave a prayer intention via our website; your intentions will be remembered daily at the shrine. The Shrine produces a newsletter that is sent to thousands of people across Britain and worldwide, and is written by the Prior Provincial. You can also keep in touch with the National Shrine of Saint Jude through our Facebook page, our Twitter feed, and our blog of news and reflections. In this section there are also instructions on how to find the shrine if you would like to visit Faversham. Finally, you can donate to the work of the Shrine and the Carmelite Order in Britain, here. We hope you find these web-pages useful and that we will see you at Faversham one day. to mark its Diamond Jubilee (60 years) in 2015.